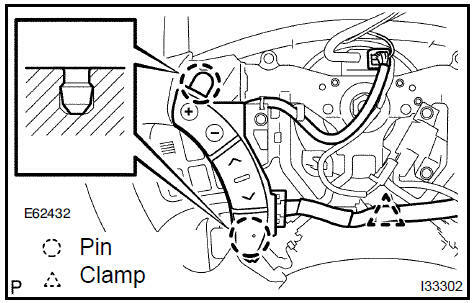 Disconnect the connector of cruise control main switch. w/o steering pad switch RH: Release the 2 pins and remove the steering pad switch LH. w/ steering pad switch RH: Remove the clamp. w/ steering pad switch RH: Release the 2 pins and release the steering pad switch LH from steering wheel. 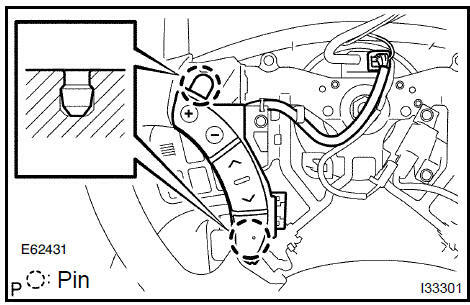 w/ steering pad switch RH: Release the tab of steering pad switch cable from steering pad switch LH as shown in the illustration. w/ steering pad switch RH: Disengage the 2 claws as shown in the illustration and open the latch on the top of the connector. w/ steering pad switch RH: Pull out the connector while pinching the latch with fingers and disconnect the steering pad switch cable from the steering pad switch LH. Remove the steering pad switch LH.